Over the past week, two separate interviews with playwright Terrence McNally have suggested that Meryl is still attached to portray Maria Callas in the screen version of Master Class. As everyone knows, the late Mike Nichols was to be the director for the HBO project, but his unfortunate passing in November has left a big question mark about whether this will ultimately move forward. As early news of this story broke last summer, it was suggested that production was to begin in "early 2015." Obviously that could be any time now. The first interview was posted on Crain's New York Business website last week. In it, there is a section where they list McNally's "dream actors" and he states "I thought I'd made my peace about not working with Meryl Streep. But she's doing the movie of Master Class." The writer of this article was kind enough to respond to an email I sent and assured me the interview took place about three weeks ago. I refuse to believe that McNally is somehow unaware of the passing of Mike Nichols. I also find it hard to believe that he would say something like this if he didn't believe or perhaps even "know" that the project was still going forward. The writer Terrence McNally said he is pleased that the play "Master Class" will be filmed and even more that will star Oscar winner Meryl Streep, whom he admires, it was reported in the area of "Javier Poza in Formula ". "I think Meryl Streep is a goddess, what I can say, I always wanted to work with her, I'm very excited, no disrespect to any of the other great actresses who have played the role, I think she will be able to achieve to a wider audience. 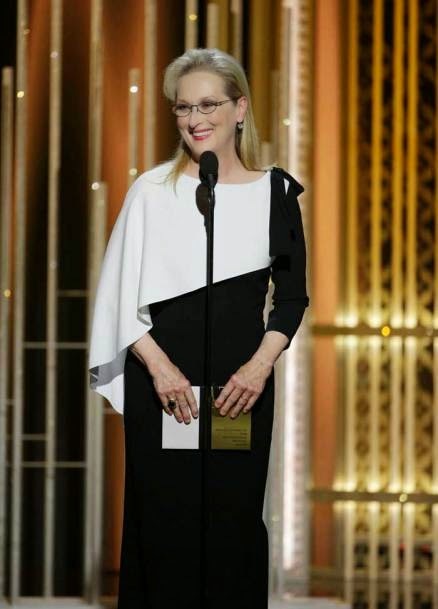 "Simply because it will be in cinema format, because if people want to see Diana Bracho theater has to travel to Mexico City or you prefer to see Patti LuPone would have to go to Broadway, so this is a great opportunity, I think Meryl is magnificent, I have no doubt, but in the end will be another interpretation of the role, "he said. I mean, come on! Again, why would he say this if, like the rest of us, he doesn't really know the fate of this project? If he were unsure about whether filming will actually take place, wouldn't it be more likely that he'd say something (if anything at all about it) like "Streep was set to star in the screen version, but with the passing of Mike Nichols, it's been put on hold."? A publicist at HBO (whose email I acquired with the help of my beloved, Joe) responded to my request about production dates by simply saying "there is no additional info." Perhaps I've already uncovered the info they're waiting to officially reveal...that the project is going forward with a new director at the helm. Even if filming didn't start until mid to late February, it's absolutely reasonable that it could wrap in about six weeks, which would give Meryl plenty of time before principle photography is set to begin on Stephen Frears' Florence Foster Jenkins sometime in May. Incidentally, I came across a podcast interview Streep did with Empire Magazine where she discusses, among other things, the upcoming Frears film. The interview begins around 7:22. My optimism for the life of Master Class has increased by a speck. I'm predicting Boyhood for Best Picture at the Oscars, but I have a feeling Birdman will take this one, and in fact, The Grand Budapest has a chance here as well. Redmayne has a shot, but I'd be surprised if Keaton didn't take this. I'd be absolutely shocked if Arquette were not the winner. If by some miracle Meryl took this it would be exciting, and since Arquette has won everything in sight up to this point and will likely win the Oscar, this wouldn't seem that undeserved. Tune in tonight on either TNT or TBS at 7:00 pm CT. I know I'm boring everyone with my obsession of whether or not HBO will still make Master Class. However, until we're through February with no word, I'm going to hold out hope that it may happen as planned. Today an article suggested that a newly greenlit biopic on Montgomery Clift starring Matt Bomer may be taking the slot that Master Class was to hold. The suggestion in this article is simply that...a suggestion, but it certainly made it seem like a foregone conclusion that the Master Class was a no-go, therefore providing an opening for this new project. Sigh. You guys, should I just give it up already? Another Sondheim musical in the works for Streep & Marshall? Broadway World is reporting that director Rob Marshall is hoping to acquire the rights to the Stephen Sondheim musical Follies, and wants Meryl for one of the female leads. Considering Marshall doesn't even have the rights to the film yet, this is probably a long way off, but still an interesting prospect. Maybe another chance to team with Glenn Close? So much for that break you were hoping for, huh Meryl? More news of this is sure to develop in the coming days. Congratulations to Meryl for again breaking her own record and receiving her 19th Academy Award nomination for her supporting role in Into the Woods. The film also garnered nominations in Costume Design and Production Design. I think I did fairly well in my predictions in the acting categories. I counted 16 out of 20 that I predicted correctly. Glad to see that Steve Carell got in. A little disappointed that Jennifer Aniston didn't make it, as Marion Cotillard was a bit of a surprise for her performance in Two Days One Night. Laura Dern in Wild! Good for her! Supporting actor went five-for-five in predictability. The full list of nominees can be seen here. Meryl has now been nominated in the supporting category for the fourth time overall, and the first time since 2002's Adaptation. It's also the 7th time she's been nominated in back to back years. I don't see this train slowing down anytime soon. Her full list of Oscar nominations now reads as follows, with wins in bold. Tomorrow is the big day! The Academy Award nominations announcement will begin at 7:30 CT with the tech-y noms first, and then approximately eight minutes later the big ones will be revealed. I've decided to list my predictions for the acting nominations with those I feel most likely to be nominated listed first. Some of the categories, particularly Best Actor, are going to be tough. Here we go! I'm really only confident in the first three. Honestly, any of the alternates wouldn't surprise me, but I would love to see Steve Carell recognized. My hope is that Aniston replaces either Adams or Jones. Simmons is taking this so everyone else is basically going to be an also-ran anyway. Again, I'm confident in the top three, and I do think Meryl will get in, but she's not locked. I wouldn't mind if Chastain made it in, but I just have a feeling the Academy likes Nightcrawler, Russo would be a first time nominee and she did just get a BAFTA nod last week. A surprise nom for Carmen Ejogo in Selma, Laura Dern in Wild or even Tilda Swinton in Snowpiercer would not be completely out of left field. Do I even dare bring up Naomi Watts in St. Vincent?. This and Best Actor will be the most fun categories to watch. The live telecast can be streamed online here. Well, as expected, Patricia Arquette took home the trophy last night at the Golden Globe Awards in Meryl's category. Despite the loss, Meryl looked amazing and created quite the Twitter buzz when Margaret Cho, dressed as a North Korean army general, posed for a picture with her during the telecast. Nice little attempt at photobombing by Ben Cumberbatch. Oscar nominations will be announced Thursday! The Golden Globe Awards are of course tomorrow night. Typically I'll throw in my two cents and list my predictions. This year is no different. I'll rank Meryl's category and then just list who I think will win in some other major film races. This is probably Meryl's only chance at an award this season, and it's a long shot, but stranger things have happened. I'd love to see Emily Blunt take home the trophy for Musical/Comedy Actress, but I'm predicting Julianne Moore to take BOTH lead acting categories. Has that ever happened? Kate Winslet won Drama Actress and Supporting Actress six years ago, but I'm not sure anyone has won both leads. If Florence Foster Jenkins somehow gets released by the end of next year could we see Meryl in Moore's place for both Florence and Ricki and the Flash? Never know! Oh, and anyone think HBO has hired a new director for Master Class?!?! I'm probably the only person in the world who's holding on to that one, but until I hear confirmation otherwise or Meryl starts filming a different project, I'll carry the torch of hope. Enjoy the Globes. Into the Woods was recognized in both the Costume Design (Colleen Atwood) and Hair/Makeup (Peter Swords King and J. Roy Helund--Meryl's personal hair/makeup man) categories, not surprisingly. Couple interesting things I noticed: Steve Carell in supporting for Foxcatcher? Amy Adams sneaked in for Big Eyes as did Ralph Fiennes for The Grand Budapest Hotel. Congrats to all. The BAFTAs will be awarded on February 8. More fantastic insights from our girl. I just love how she communicates the intricacies of the themes in the film. She also sheds some light on Russel Crowe's recent comments that many interpret to be sexist. Enjoy. Taping of the Graham Norton show is probably already complete, so hopefully we'll have access to that soon. I believe it airs Friday in the UK, the same day as the BAFTA nominations. New featurette for "Into the Woods"
Yesterday a sort of "making of" featurette was released for Into the Woods. The film continues to slay at the box office. In its second weekend it grossed another $19 million for second place, and currently stands at about $92 million domestically. BAFTA nods come out on Friday and I'm not optimistic for Meryl, although Emily Blunt may have a good shot at a lead nom. If either of them happens to pick up a Golden Globe Award this weekend, it could obviously boost the box office draw. Happy New Year! Another great year for Word on the Streep. I would like to thank any and all readers/commenters for your viewership. It makes maintaining this blog worth it when I know my posts are actually read on occasion. I truly appreciate all your insights and enthusiasm! This should be a pretty busy year for Ms Meryl. Into the Woods is currently slaying at the box office. The Golden Globe Awards are next weekend, Oscar nominations come out four days later, then SAGs at the end of January. I'm still hoping beyond hope that by some miracle Master Class still gets made, as it was set to begin filming this month. Florence Foster Jenkins is scheduled for filming in May (still think it's a possibility for a 2015 release). Over the past week, several sources have been now listing an updated release date for Ricki and the Flash,which has apparently been pushed back from June 26 to August 7. The August date is similar to both Julie & Julia and Hope Springs. Considering Wikipedia, Box Office Mojo and an article in The Atlantic now list the new date, I've gone ahead and changed it on the countdown. You can see I've also added a countdown for Suffragette, as there's finally a believable release date for the film of September 11 in the U.K. No word yet on its U.S. date, but as it's a British film, I don't imagine it will be before the 11th. Finally, with the recent news from FilmNation, we may see Meryl re-teaming with Bob De Niro in the fall to film The Good House. It's likely Meryl will take some time off after this year, but hopefully it's not more than a year between projects. I prefer when she has at least one picture released every calendar year. Cheers to Meryl, the new year and to all contributors on this site!